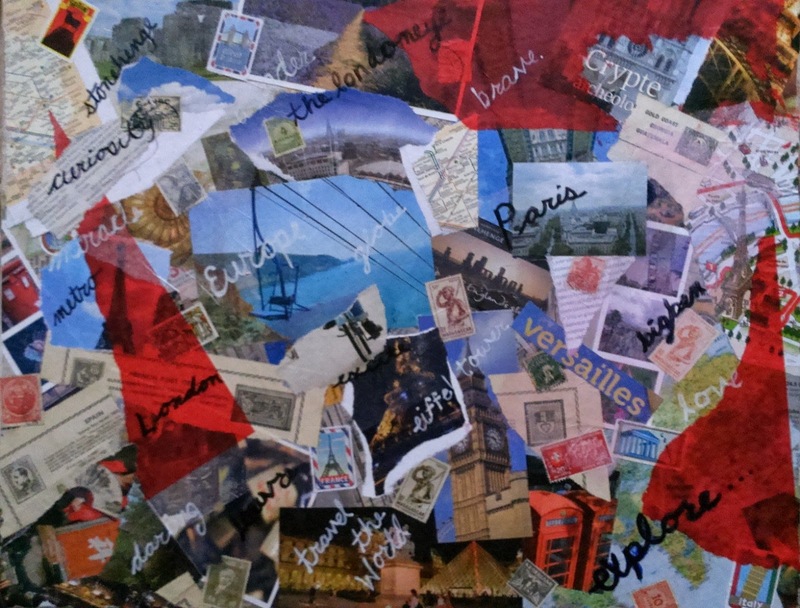 For one of my summer projects, I chose to do a collage using pictures and postcards from my trip to Paris and London. I love to travel and I knew I wanted to depict that in my art pieces so I use things I had gotten from these different countries. I started with a background of plain newspaper and layered photos, postcards, stamps, and maps on top. I then decided to add red and pink tissue paper on top to provide more contrast and vibrant colors. I still wasn't all that happy with it so I wrote in black and white across it words that I thought described my personality and love of travel. I still feel like it is missing something so I will probably add more color or a larger image; something to draw your eye to on the canvas.